Del Rey has the details on how San Diego Comic-Con attendees can get a copy of the convention exclusive edition of Battlefront II: Inferno Squad. It’s a little more complicated than the Thrawn sales at Celebration, but will hopefully result in more folks being able to actually get the book. → J.W. Rinzler, formerly of Lucasfilm, is writing a blog series about his time with the company, as well as his own history with the Bay Area. Check it out on his blog. → And finally, some release notes: On the Front Lines got pushed back at some point. It’s now due out in August. The schedule has been updated. The first review of E.K. Johnston’s Ahsoka has appeared on Kirkus. It’s short, but there do appear to be some minor spoilers. Still, they say it “a great treat for young—and not-so-young—Star Wars fans that provides a thrilling back story for a compelling character.” The book is due out October 11. → Checking in with The Making of Star Wars: The Force Awakens. Co-author J.W. Rinzler was on a podcast recently, and long story short, it’s still a big question point. → Star Wars Reads is back for 2016. The generally kid-centric event is “a month-long campaign” set for October. Lucasfilm’s Jonathan Rinzler did a Reddit AMA. Lots of interesting stuff, but as for big ‘news:’ George Lucas thinks Boba Fett survived the Sarlacc and there’s another big archive project in the pipeline. No details, though. 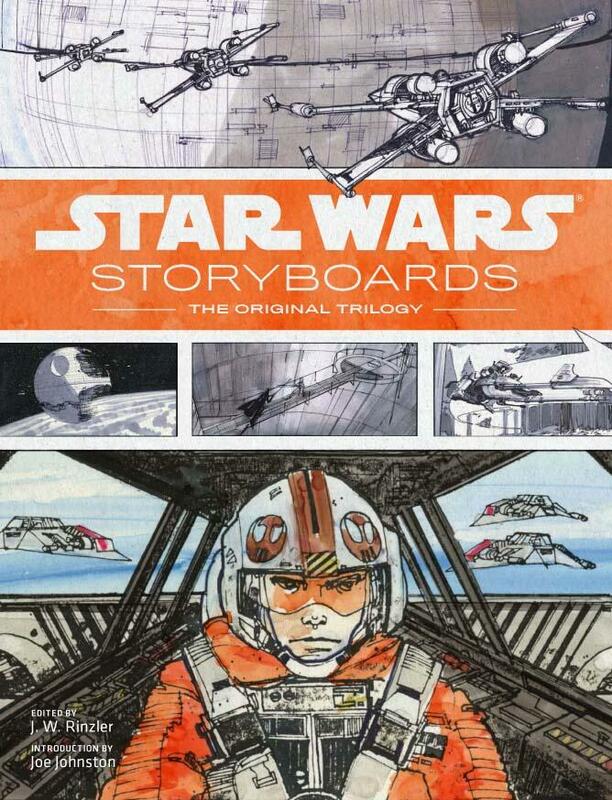 Star Wars Storyboards: The Original Trilogy, edited by J.W. Rinzler, will be in bookstores on May 13 (next Tuesday.) If you can’t wait, the prequel trilogy one was released last year. With the release of Star Wars Storyboards: The Original Trilogy less than a month away, Vulture has a look at some of the earliest visuals for A New Hope and The Empire Strikes Back. The book, edited by Lucasfilm’s J.W. Rinzler, will be available on May 13. Upcoming. J.W. Rinzler revealed the cover for his Star Wars Storyboards: The Original Trilogy on Twitter earlier today. The book is due out May 13. And on that note, Joe Schreiber’s Darth Maul: Lockdown has been pushed back a week, from January 21st to the 28th, Del Rey tweeted. The trade off: The first mini-excerpt from the book. The blogside. Over at the official blog, Pablo played with fire by looking into the lengths of Super Star Destroyers, Jennifer Heddle sung the praises of the galaxy’s non-force sensitives and Jason Fry and Paul Urquhart looked into ancient Coruscant. Reviews. James’ thoughts on Star Wars #10 and Ewoks: Shadows of Endor. And so the Making of eBook poledance continues, with video clips on Yahoo (stormtrooper on fire!) and Mashable (Hamill and Fisher’s chasm jump). Today, Entertainment Weekly heads to the Sarlacc. Weighing the purchase? StarWars.com has a complete listing of the additional content for each book. Releasing Tuesday are the eBook versions of J. W. Rinzler’s Making of books for the original trilogy, featuring video, audio and other extra content. Random House has them priced at $17.99, but check your device’s marketplaces. Comic fans can head to the shops on Wednesday for Legacy #8. It’s also time to keep an eye out for the new Star Wars Insider, which features a Leia short story bu editor Jen Heddle. Next week brings The Bounty Hunter Code: From the Files of Boba Fett (now dated to the 29th) and the still-pricey-but-not-ridiculously-so version of Frames. And there’s a fairly recent update to our book release schedule – the Crucible paperback is scheduled for May 27.